It’s easy to put off our own health by being too busy or not knowing how to begin. 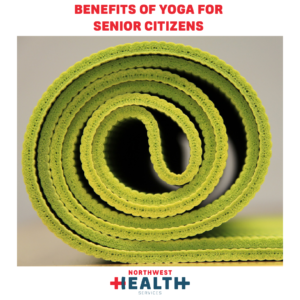 However, seniors and caregivers alike can greatly enhance their lives through both meditation and yoga. One is a form of gentle exercise for all ages, and the other is a healthy way to process stress and learn to relax. Here’s everything you need to know. Most people know that moderate exercise is good for us. It keeps our bodies and minds healthy. And yet, most of the population doesn’t get the required amounts, which is about two and a half hours a week. It can be difficult when we’re exhausted from work or don’t feel well enough to start. However, an exercise regimen can improve our energy levels and how well we feel. Yoga is an excellent way to introduce some form of gentle yet productive exercise into our lives. No matter one’s age or physical condition, yoga can be the perfect method of staying healthy. It improves strength, which is important for caregivers, while simultaneously increasing flexibility and balance, both of which are imperative for us as we age. Those who need to ease slowly into a routine can use a chair for added stability. It’s simply important to begin. While it may seem a normal part of life in the 21st century, stress should not dominate our lives. It is detrimental to our physical, mental, and emotional wellness. It can also lead to heart issues, high blood sugar, headaches, depression, insomnia, and many other ailments. Yet, many of us don’t have healthy coping mechanisms to process our daily anxieties. Meditation can be just what we need to lead healthier, happier lives. It teaches us to enjoy the present moment and keeps us grounded even when things go wrong. Much of stress comes from living outside the current moment. We think about what may happen and become anxious, or we think of what we have gone through in the past and become distressed. Practicing meditation is a way to break this habit and become more familiar with our inner strengths. Yoga requires enough room to physically get into its positions, but meditation too needs a dedicated area of relaxation and peace. Choose an area in your home with plenty of open space or room to make space. If you have a large yard and good weather, you could even consider taking your yoga mat out of doors to enjoy fresh air. However, you want to be sure that you have a reliable internet connection to use online tutorials or classes. WiFi is best for this, as it can reach anywhere in or out of your home. If you want more hands-on instruction, it’s best to seek out classes in a yoga studio where an instructor can teach you proper form. Medicare alone won’t cover the cost of yoga classes, but there are some Medicare Advantage plans that will. Consult online resources to learn more. Starting something new can be intimidating, but it doesn’t need to be. If you’re worried about starting a physical activity, speak to your doctor first, but know that there are plenty of ways to ease your body into a gentle routine. There are several poses you can do to begin to help your body adjust to these new movements and to simultaneously build your balance and core strength. As mentioned, a chair can also be used for stability if you are truly worried. If you are hesitant to begin meditating because you don’t think you’re able to concentrate, you needn’t worry. There are as many kinds of meditation as there are people. The overall goal of meditation is to teach you to realign your focus. You can do this any number of ways, but the easiest is to start by repeating a mantra or paying attention to your breathing. You could also try dedicated apps, put on a guided meditation, or listen to relaxing music. The steps you make toward health are important. Being physically active and learning to let go of stress are necessary at every stage of life. It’s time to start putting yourself and your needs first every day, even for just a few minutes.